← Greetings from Astrid’s Nemeton! 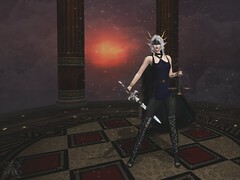 This entry was posted in A second life in pictures, Fantasy Faire 2018, The Amazing Catwoman and tagged Erstwhile, Fantasy Faire 2018, Fantasy Faire Radio, FF 2018, Gauze, HarshLands, LAQ, LitFest, Lumae, Maitreya, Nyza Stillwater, Raven Bell, Stitched, The Dark Fae, The Little Bat. Bookmark the permalink.